The idea of Super Tuscan wines can be confusing to some people. In a nutshell all that term means is that the wine does not conform to the local standard of grape content. 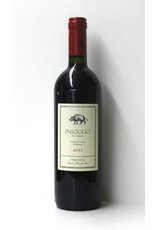 So a Super Tuscan might be all Sangiovese (Tignaello for example) or no sangiovese as in Insoglio. This wine is a blend of Cabernet Franc, Syrah, Merlot and Petit Verdot. International grapes that retain an Italian character. Easy drinking but with a beautiful structure this wine will pair well with staek or grilled meats as well as wild boar, of course.